In this article written by Stan Johnson, a columnist for the Citizens Tribune, he writes about the current events happening at many colleges having to do with free speech. He states that many speakers who want to state their opinions in college aren't being let by the protesters that show up to the events and are even in danger because of these protesters. He says that this only happens to conservative speakers, like Ann Coulter, who aren't allowed to speak and exercise their free speech by what he says are “liberal” students. These students who protest, in his opinion, do not support free speech nor tolerance for it because of their actions against speakers who come to their college. He even offers a solution to this problem by saying that funds for colleges that don’t truly allow freedom of speech should be cut. Johnson expresses a rather conservative point of view that is influenced by many factors. One of them being that he’s from Tennessee, a mostly republican state. Specifically, he writes for Citizens Tribune located in Morristown, TN, which is an older town. His views reflect that of a more conservative view and the actual website seems like it has more conservative views based on other articles. Because he is more conservative, his view on the right of freedom is obviously more strict. He believes in all form of free speech allowed even if it is hate. Which is why he defends all sort of speech at college campuses. He clearly doesn't understand being a minority because he isn’t one and hasn't experienced being is bashed upon by hateful speakers. This makes him inclined to think that people who protest shouldn’t protest against the hateful speakers because the are only “exercising their right of free speech”. In this article written by Collin Binkley, a writer for the Washington Post, he explores the various point of views people have in accordance to the issue of free speech at colleges. May argue that free speech is slowly being diminished by those who protest against the various people who give hate speeches at colleges or those who have conservative viewpoints. While many people are against these protester, others view the protesting against certain speakers as a moral obligations that they have in order to not let a person bash a group of people. Many universities understand this but still remain in neutral territory not wanting to support nor neglect any side. These different point of views have to do with what was mentioned in the article; the fact that there are students who feel like they are being attacked by the speakers and that there are people who are conservative. There is a split among people and their different views that cause this sectionalism. While those who go to colleges in order to state their opinions think that's well within their rights, many think there is a limit on that right. The progression of time usually marks the progress of ideas too. This split between people is the main cause of this conflict. This makes both groups of people want to be right. This division has to do with people’s backgrounds and what they have experienced. In this political cartoon, it depicts the way usually conservatives abuse free speech. The cartoon shows a protester against abortion, a KKK member, a nazi, and a middle eastern man with gas and the American flag. 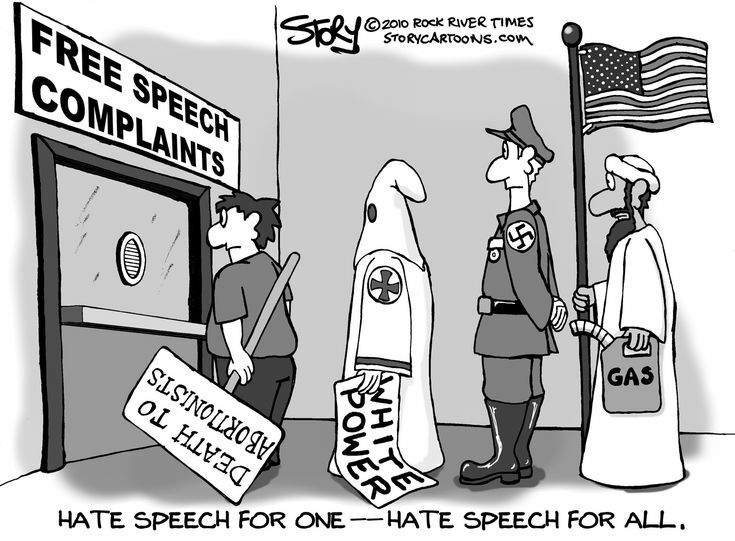 The person who created this cartoon clearly shows that many abuse the use of free speech and use it for hate. This hate that they spread for them is justified and something they can do. They think it's well in their right to express their ideas and will complain if there speech is limited in any sort of way. Also if the hate speech is guaranteed to one person then it is guaranteed to all. This is because if one person gets away with their hateful speech then others will think it’s within their rights to do so too. The person who drew this works for a political cartoon website that has many other cartoons that seem like they come from liberals. The person who drew the cartoon most likely does not think that they don’t have the right to say hateful things but rather they shouldn’t complain about their ”free speech” being limited. That they should be well aware that their sort of speech may provoke violence or other disturbances. It shouldn’t come to a surprise that they may have trouble with this free speech. This cartoon was published in 2010 when things weren’t as intense as now in 2017. There’s not much information on who the person is that created the cartoon or their stances on free speech other than the cartoon. In this article written by Karol Markowicz, a columnist for the New York Post, she explains that there is freedom of speech but that there are consequences to what you say. She says freedom of speech is not something that has guaranteed and protected everywhere. While freedom of speech protects you from any sort of government consequence for what you say, there is nothing that keeps you from being fired from your employer or even keep you from having a job. The sort of free speech she implies that everyone has is free speech against anything government related. Anything outside the government could have it’s consequences. Markowicz point of view is that of more open conservative republican. Based on her other post and her background, she is an open Republican that has some liberal ideas. She supports things that most conservative Republicans wouldn’t, like gay rights. She is not native born in the USA and was actually born in the Soviet Union, but was raised in Brooklyn. Her not being born in America and having that immigrant background most likely affects the intensity of her being a conservative. This most likely has driven her to being a more open person and more open regarding her political stance. Although she does free speech in all sort of ways she realizes that there are certain limits on free speech and that it only usually is fully protected in terms of government related things. In this article written by Bob Collins, a writer for MPR News, he explains that many people use “free speech” to justify racism. He explains that many defend hateful speech regardless if it aims to put down a group of people by saying they are only supporters of defending the rights of people. That also people who are racist always try to justify their racism by saying it’s free speech and not actually racism. Many of the people who are racist feel attacked when they are not allowed to use their “freedom of speech” which in reality is just hate speech. If people tell them otherwise they don’t feel that their freedom is guaranteed to them. As he puts it, the “freedom to be a racist”. Collins seems to have a rather liberal point of view. He lives in Minnesota which is a Democratic state with very few republicans. He is most likely Democratic which means he is more open and is not a conservative. Him saying that freedom of speech doesn’t mean you can be racist exemplifies the values that most democrats and even liberals have. Minnesota is a Liberal state. He moved there from Massachusetts which is another liberal state. He has always been surrounded with these liberal ideas which most likely has influenced his values. This is why h e has a more open and not conservative view on free speech. That of one that condemns hate speech and one that does not accept hate speech as part of your constitutional rights.